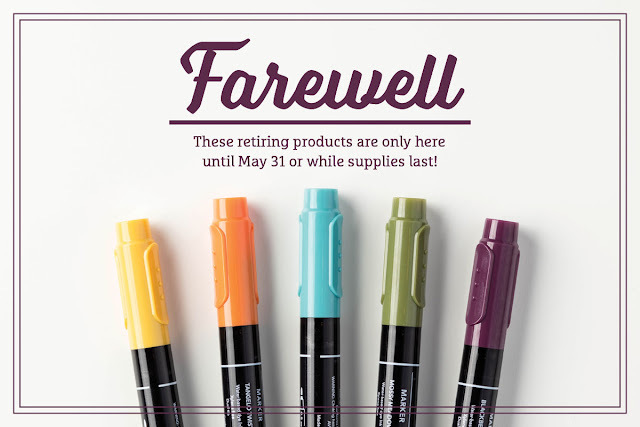 I have been lax in getting details to everyone on the retiring products from Stampin' Up! If you are interested in getting your hands on them before they are all gone, here is a link to where you can view a pdf file to make your selections. Items are limited, so you won't want to wait too long. Many are also deeply discounted! June 1st is the date that the new catalog will be released and you can order all the fantastic new products. I will give you some sneak peeks in the next few days of some of the products I was able to get my hands on in a pre-order I did at OnStage. They are introducing 5 new colors and 5 are retiring. I am sad to see them go, but, WOW...you'll love the new ones too! I can't show you the inside of the new catalog yet, but this is a definite sneak peek! I can, however, show you some product and samples made. So, come back tomorrow!